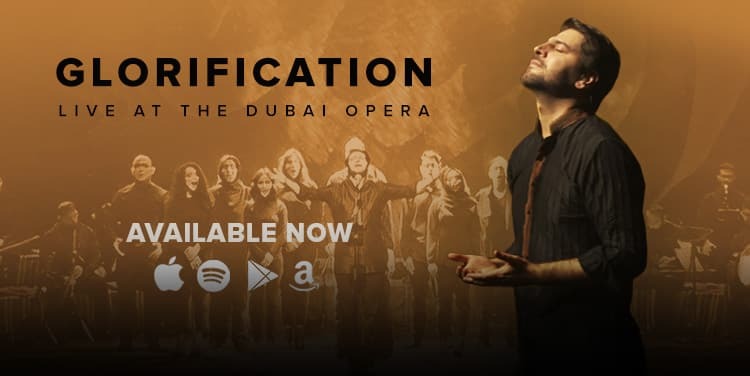 ‘Glorification’ is a special song composed by Sami Yusuf with words taken from His Highness Sheikh Mohammed Bin Rashid Al Maktoum’s beautiful poetry. The song was debuted and recorded live on 16th December 2016 at Sami Yusuf’s incredibly successful concert at the iconic Dubai Opera featuring some of the UAE’s most talented vocalists – many of whom were handpicked and chosen by a special committee and subsequently trained by Sami Yusuf after completing a rigorous auditioning process. Musically speaking, this piece is a marriage between East and West. The composition incorporates traditional instruments of the eastern and western parts of the Muslim world underpinned by a Western/European modal system. This piece showcases the superb virtuosity of the musicians for it stretches the boundaries of what can be played on such instruments. The subject is the Supreme Reality (known in the Islamic tradition as ALLAH) which according to the Islamic tradition has ninety-nine beautiful Names. Some are Jamālī (feminine/ beautiful) and some as Jalālī (masculine/majestic). Sami Yusuf’s composition strikes a balance between the two as do the profound lyrics. The author of this poem. His Highness Sheikh Mohammed Bin Rashid Al Maktoum, has a deep love for humanity and a vision of unity among peoples that is evident throughout all his life’s works. It is this vision that inspired Sami Yusuf to add over a dozen backing vocalists from around the world to tonight’s performance of Glorification. A call went out for auditions to which many talented singers from across the world replied. On 16th December 2016, the audience was treated to this musical collaboration that honours the farsighted ideals of His Sheikh Mohammed Bin Rashid Al Maktoum. We are delighted to be finally sharing this live recording with the world. from which all names take their grace. from Your lofty dwelling place. omniscient, just and divine, our Judge in all Your glory. as You nurture us here on earth. In Your warmth we glorify. Revealing Your word and light. Your justice is all men’s right. Your forgiveness is my plea.